One of the little-known wet fly patterns from Trout, by Ray Bergman, is the Fletcher. It is not a particularly complicated pattern to tie, except for step two: the tail. It has a married tail consisting of three components. This element gives the Fletcher a special attractiveness and eye-appeal. I admit to never fishing the Fletcher, but I have tied a good number of them over the last fifteen years. I think that is something I should rectify – fish this fly. I’m sure it would take trout and land-locked salmon. This fly is one of six that is part of an order for a customer in Alberta, Canada. He has ordered five dozen wet flies for fishing, and six wet fly patterns, tied on #4 hooks, mounted, boxed, and signed for his collection. The Fletcher is the second pattern in this series of six, the Parmacheene Belle from the other day was the first pattern in this six-pack. I also intend to post the photos of the fishing flies on this order. Fletcher wet fly – dressed on a Mustad #4 – 3906 standard wet fly hook. Tied and photogrpahed by Don Bastian. The recipe in Bergman’s Trout calls for a gray hackle, tied palmer, but study of the color plate, recognizing artist Dr. Edgar Burke’s attention to detail, and the fact all the flies for the color plates in Trout were painted from actual samples, the hackle on the plate image is clearly painted as grizzly. I married the tail with duck wing quill and guinea fowl wing quill. 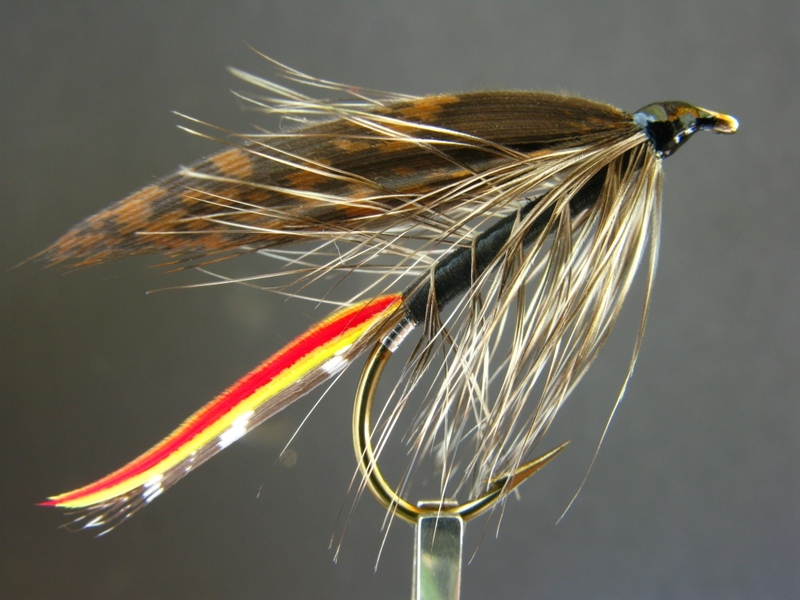 Wet flies with a palmer hackle have plenty of action in the water. I need to tie some of these to fish with. This entry was posted in Fly Pattern Recipes, Wet Fly Photos and tagged Classic Wet Flies, Dr. Edgar Burke, Fletcher, Ray Bergman, Trout. Interesting that the body is understated yet the tail shouts “come and get me”! The palmered hackle looks sparse, I am assuming that you stripped one side of the feather? That’s a very good way to put it! Come and get me! For me, the married tail is definitely the appeal of the Fletcher. I did strip the leading edge of the hackle before palmering it. Thanks for your comment! I really like this pattern! I really appreciate the style of these flies, but some of the classic patterns I consider to be too garish for my everyday use. This one, among many others, appeals to my more naturalistic preference. I love having these for display, and am thankful that you are keeping the tradition alive! Thanks very much for your comment! I understand where you’re coming from. But I’ve caught trout on “garish” patterns, so both plain and fancy wet flies have a place in my fly box. As noted in my post, I do want to tie some Fletchers for fishing…I think it would take trout well! Thanks again for your comment and kind words. Dr. Edgar Burke was my Great Uncle and I probably sold some of his flies in a garage sale for pennies! He was a great wildlife artist and I have some of his oils. They might still be available to those interested. This is awesome to find a living relative of Edgar Burke! On rare occasions an Edgar Burke original shows up on eBay. I was fortunate to see and hold in my hands seven of your great uncle’s original fly plates from Ray Bergman’s Trout, when I met with his niece and nephew Norma and Buddy Christian, while working on the Ray Bergman biography for Forgotten Flies back in 1998. Thank you so much for sharing this information!